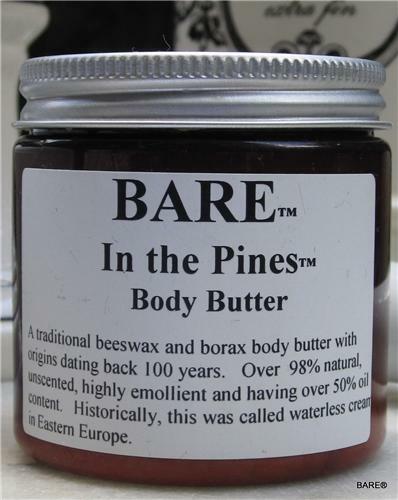 BARE "BARE IN THE PINES" Body Butter . Pine essential oil has a distinctive essence and gives a sweet aroma to the cosmetics it is used in. Pine plant oil is widely used as massage oil and in perfumes and other scents. The health benefits of pine oil include some emotional benefits. It gives an energizing, invigorating feeling. Pine plant oil is also useful for people suffering from loss of concentration and loss of memory. Regular massage with pine essential oil lends mental clarity. Sunflower Seed Oil, Soya Bean Oil, Jojoba Seed Oil, De-Ionized Water, Natural Beeswax, Emulsifying Wax NF, Sodium Borate, Aloe Vera Leaf Juice, Fragrance, Chamomile Flower Extract, Disodium EDTA. Phenoxyethanol and Caprylyl Glycol.